In its 2,500 years of existence, Macedonia’s welcoming capital city has had many different embodiments. Traveling throughout Republic of Macedonia, the amazement constantly rises because of sight of the beautiful green mountains, in particular in the western part of the country. The greatest tourist attraction and definitely the most powerful beauty that Republic of Macedonia has to offer is the Ohrid Lake. Republic of Macedonia is a country situated in the heart of the Balkan Peninsula, south-eastern Europe, bordering with Republic of Greece on south, Republic of Albania on west, Republic of Serbia on north and Republic of Bulgaria on east. The Republic of Macedonia has an estimated population of 2,055,915 citizens, according to the last population census in 2002. More than half of the Republic’s inhabitants (58.1%) live in urban areas, most of them in the capital, Skopje (more than 500,000), followed by Bitola (85,000), Kumanovo (70,000), Prilep (70,000), Tetovo (51,000), Veles (47,000), Ohrid (43,000), Stip, etc. There are 1,753 populated settlements. According to the 2002 census, the ethnic Macedonians are largest ethnic group in the country. 1,297,981 inhabitants declared themselves to be Macedonians, representing 64.18% of the total population. The second greatest ethnic group are the Albanians. Approximately 535,000 inhabitants are declared as Albanians, representing 25.2% of the population. Smaller ethnic minorities include Turks (77,959 or 3.85%), Roma (53,879 or 2.66%), Serbs (35,939 or 1.78%), Boshniacs (17,018 or 0.84%), Vlachs (9,695 or 0.48%), and other (20,993 or 1.04%). Official language in the Republic of Macedonia is the Macedonian language, whereas in areas inhabited with more than 20% of the minority population, their language is also considered to be an official language. 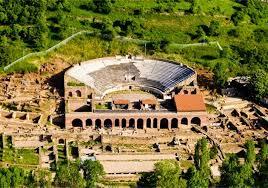 Macedonia’s history of civilizations is more than 9000 years long, full of captivating tales and fascinating events. One of them would certainly be the mysterious civilization that has built Kokino megalithic observatory, world’s fourth oldest, but the history of Macedonia is full of nations, civilizations, cultures and religions, conflicting and mixing, in a unique tradition. The first Macedonian kingdom is dated back to late IX century BC, with Caranus as its first known king. Throughout the ages, a strong empire emerged from this kingdom, under the leadership of Philip II and his son, Alexander the Great. Divided among Alexander’s generals, this Empire was conquered later on by the Romans. Macedonia subsequently became a part of the Byzantine Empire and an important Christian center which produced the most extraordinary frescos conveying dramatic facial expression and emotions not commonly found in Byzantine art. It was also the first and most important center of Slavic literacy. Toward the end of X century, Tsar Samoil formed his Macedonian Empire, conquering large part of the Balkans. Crushed by the Byzantines, Macedonia saw numerous rebellions and short-lived Bulgarian and Serbian reigns, a period that definitely ended with the arrival of the Ottoman Turks. Their rule lasted over five centuries. 1903 saw a huge uprising against the Ottoman rule, resulting in the creation of the first Republic on the Balkans, the Krushevo Republic. Although it lasted for only 10 days, the ideas from its Manifesto and Constitution made it immortal; it served as inspiration to the movement of the Young Turks and the legendary Turkish reformer and founder of modern-day Turkey, Kemal Ataturk, who was born and educated in Macedonia. The subsequent Balkan and World Wars, brought different armies and rules in Macedonia. After World War II, Peoples Republic of Macedonia was declared, as a part of the Yugoslav Federation. Since 1991, Macedonia is an independent state. The greatest tourist attraction and definitely the most powerful beauty that Republic of Macedonia has to offer is the Ohrid Lake. Referred as the “Pearl of Macedonia”, the city of Ohrid is one of the oldest human settlements in Europe. The magnificent beauty of the Lake, its superb shores, and the mixture of the new and the old, of the west and the east on the streets of the city of Ohrid give a wonderful opportunity for enjoying in a nature beautiful beyond words of description, as well as to experience the transcendence of the past into the present. 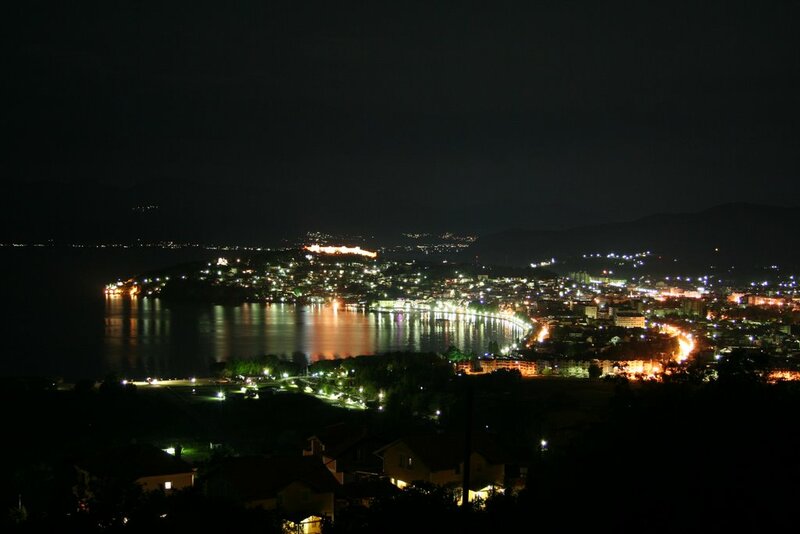 The town of Ohrid and Lake Ohrid have been placed under the protection of UNESCO as an outstanding environment. Traveling throughout Republic of Macedonia, the amazement constantly rises because of sight of the beautiful green mountains, in particular in the western part of the country. The astonishing landscape of the mountains of Shar Planina (2747m), Korab (2864m), Baba (2601m), Jakupica (2540m), Deshat (2373m), Jablanica (2257m), Osogovo (2252m), Kozhuv (2171m), Belasica (2029m), Maleshevo (1745m), and others, in every season of the year are wonderful places for experiencing genuine natural beauties. The mountains of Pelister, Mavrovo and Galichica are National Parks and are protected by the Law, each offering a superb opportunity for winter sports. 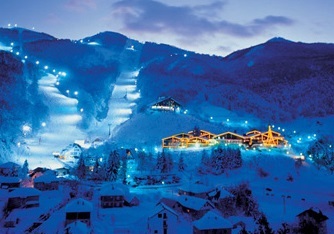 The most famous Ski-centers in Republic of Macedonia are Mavrovo, Shar Planina, Pelister and Krushevo. Macedonia has about 1,200 churches and 425 mosques. There is a Roman Catholic church in Skopje, and the other religious communities have their own places of worship in the capital and in other towns in the Republic. Only in Ohrid and the surrounding area there are approximately 365 churches. 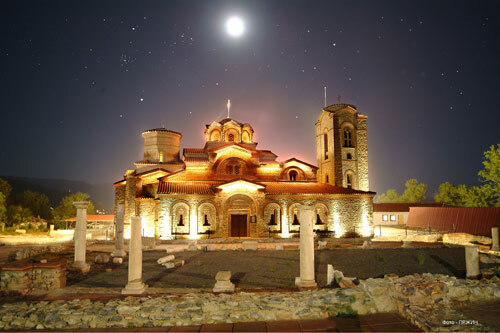 Most attractive, most visited are St.Pantelejmon (s.Nerezi, Skopje), St. Joakim Osogovski (Kriva Palanka), St. Jovan Kaneo (Ohrid), St. Naum (Ohrid), St. Georgija (Kurbinovo, Resen), Plaoshnik (Ohrid), St. John The Baptist (Stip), St Jovan Bigorski (Debar), St Spas (Skopje) where, in particular the last two are genuine testimonies of the extraordinary carving skills of the craftsmen that decorated them. The population of Republic of Macedonia consists of the following religions: two-thirds of the population are Orthodox Christians, 30% are Moslems, 0.5% Roman Catholics and 2.8% are of other religious affiliations. The Macedonian Orthodox Church represents maybe the greatest factor for preserving and keeping the Macedonian integrity, as well as identity and culture. The freedom of religious confession which understands the right to express one’s faith and belief freely is quarantined by the Constitution of the Republic of Macedonia.